A lot of fiction-writers struggle with dialogue. It’s tough to make fictional people sound convincing; it’s even tricky to punctuate dialogue correctly. But dialogue is an essential part of your story. It makes your characters seem real; it’s often vital to the plot. It keeps your story fast-paced and easy to read, partly because of the way dialogue breaks up a page of text. I usually find dialogue much easier to write than action or description. Even so, I’ve picked up plenty of tips over the past few years – and I’m hoping these will help you too. Don’t let characters give long, unbroken speeches. In a normal conversation, there are interruptions, questions, or at least visual cues (e.g. someone nodding or frowning). Use language that’s appropriate for your character. Most people will use contractions (“isn’t” rather than “is not”) when they talk; some will use non-standard English like “ain’t” or colloquial phrases. Don’t always have your characters speaking in complete sentences. They might just say a single word or phrase, or they might trail off. The dialogue isn’t a true representation of how children speak (especially as Card’s child characters are extraordinarily intelligent) – but it sounds realistic, with the use of contractions like “you’re” and non-standard words like “gonna”, as well as the insults (“moron” and “turd”). It’s all too easy (and I’ll confess I’ve fallen into this trap) to go a bit too far in trying to make your dialogue realistic. Yes, if you listen to any real-life transcript of conversation, there’ll be a lot of pauses, “ums”, “you knows”, run-on sentences, and so on. Your job as an author, though, is to give a flavour of real dialogue, not a faithful reproduction. This, for instance, could be a verbatim reconstruction of a conversation, but it’s going to (a) quickly become annoying to read and (b) make the characters sound slightly moronic, even if they’re not supposed to be. Save the pauses, “you knows” and “ums” for when you really want to convey hesitancy or uncertainty; don’t use them as part of every conversation. It’s the speaker’s name (or a pronoun referring to them) plus a speaking verb. This “tags” the dialogue as belonging to a particular character. When I was a budding writer at primary school, I remember being taught to vary dialogue tags – we had to come up with a list of different words to use instead of “said”. While this is a great exercise for building a child’s vocabulary, it’s a useless one for real writers. Readers don’t notice the repetition of “he said” or “she said”. We’re so used to reading these that our eyes just skim on over them. But if you throw in a few unusual dialogue tags, those will stand out. Tags like “snarled” or “expostulated” probably don’t belong in your story, unless you’re writing a humorous piece. I’ll occasionally use “whispered” or “yelled” if a line needs to be delivered at a particular volume! It’s also a good idea to avoid using adverbs and adjectives with your dialogue tags. Often, your character’s tone will be apparent from the words they use; you don’t need to tell the reader “John said angrily” or “Susan asked impatiently”. “He should have been home by now.” Sarah paced around the room, pausing long enough to glance out of the window at the empty street. If you have a conversation between two people, you can sometimes get away with just having the lines of dialogue, with no tags at all, for a short space. This works especially well if the characters have quite different speech patterns. Here’s an extract from Jeeves and the Feudal Spirit by P.G. Wodehouse. The first line is Wooster’s, then the second is Jeeves’. If you’re at all familiar with the characters, it’s very easy to tell who’s who! …and it goes on with a few more lines before there’s a line of action. For lots more on dialogue tags and dialogue beats, check out Are You Using “Said” Too Frequently? Dialogue Tags and Dialogue Beats Explained. Something that’s obvious when you just have dialogue, but not so obvious when you have a mixture of dialogue and action, is that each new speaker should have a new line. “Could he be right?” David asked, turning to Rachel. “I don’t know,” she said. “Could he be right?” David asked, turning to Rachel. If a character does something just before they speak, you’ll also want to move their action onto the new line. Dialogue can be fiddly to punctuate, because of the quotation marks. The main thing to remember is that punctuation goes inside the closing quotation marks. This applies whether it’s a full stop, exclamation mark, question mark, or comma. If you’re ending dialogue with “she said” or any other tag, then the dialogue sentence should finish with a comma, not a period, and the tag should start with a lower-case letter (unless it begins with a name, obviously). “I found out all about it,” she said. “I found out all about it.” She turned away. In both cases, the punctuation still goes inside the quotation marks. Most of the time, dialogue tags or associated actions go before or after the dialogue. Sometimes, though, you’ll want to position a dialogue tag or action in the middle of the speech. Usually, you do this to indicate a pause. It’s also a useful way to get the dialogue tag in near the start, if a character is going to deliver several sentences of dialogue. Whew! Dialogue is a lot of fun to write, though it can be tough to do well – it’s definitely a good idea to go back and edit your dialogue carefully after writing the first draft. If you found this post useful, I’d love if it you’d share it with friends – by emailing or Tweeting it, or by sharing it on Facebook. Thanks! “Nice, clear, and concise,” she said. Daphnee’s last blog post ..Merry Ostara 2012! You mentioned Ender’s Game! I love you more than I already did. ^_^ Another bit of helpful advice arriving just in time to resolve a problem I read while Beta-ing for someone. It’s like you’re following the fanfiction authors I read for and write these posts to help them out (and I’m the humble messenger). And Ender’s Game just happened to be close to hand when I was looking for dialogue examples…! What of quotation marks and apostrophes? I’ve taken to using apostrophes instead of quotations except when a character is actually quoting. Not sure if that’s right. You can use single quotation marks (I think that’s what you mean by apostrophes) or double quotation marks, either is fine — the key is to be consistent. Here in the UK, single are more common than double, but I prefer the way that the double ones look! ‘This is fine,’ she said. “And this is fine too,” she added. It never ceases to amaze me how incredibly difficult it is to write dialogue. No matter how much time you spend talking, writing out a conversation is tough. Number 1 and 2 of this list really resonates with me. Finding that balance between “real talk”, but “not too real” can be torture. Thanks for the tips! Thanks Cristelle! And yes, it can be really tough to hit that balance — that’s where the third/fourth/fifth draft come in for me…. 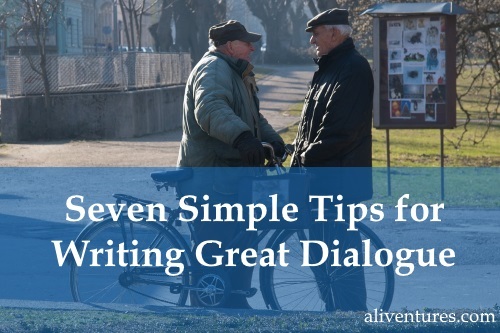 Dialogue can indeed be difficult, more so the longer the same conversation rolls on. It is important to break most dialogue up with some sort of distraction or action, as in real life. It gives both the writer and the reader a chance to step back and breathe and to assimilate what was said. I know that as a ‘talker’ that I can wear on people without realizing it in person. I do my best not to and find that writing dialogue helps me in look for the natural breaks in my own conversations. Tension in the dialogue and in the narrative should move the story forward drawing in the reader/listener not close them off with deafening drivel and unnecessary banter. Ali, thanks again for another brilliant post. Thank you for giving specific advice about what to do in certain writing areas. I get kind of tired of some bloggers complaining about what some writers do wrong, without explaining how to do it right. More bloggers on writing should follow your example. Thanks Ali. I still sometimes slip up after many years of experience. It’s good to be reminded of the basics in such an understandable way. I find it amazing how well you explain the essentials of writing dialogue with fitting examples. This refers to your point #5. In “The Elements of Style” by Strunk and White, the authors have said that it is a good practice that every speaker should be a given a new line but even if an author writes dialogues of two or more people in the same line, it is still correct. Perhaps this matter is a matter of choice as different organisations follow different style rules. In fact, Mrs. Luke, I was about to email you with the following question, but after seeing the above stated point here, I decided to ask here itself. Everyone says that the book Elements of Style is for the general audience. I don’t understand how can a style manual be for the general public as different organisations have different style rules? Stephen King in On Writing, too has recommended The Elements of Style saying that every aspiring writer must read it. But don’t you think that every writer must read the style manual of his publishing house? Please answer my question. I’m very much frustrated with this question from the past several days. I think you’re on the right lines here, Farhan. In this case, Strunk & White are saying that either method is acceptable, but that starting a new line for each new speaker is preferable. There are hundreds of cases in writing, particularly in English, where there are two more more “correct” ways to do something, and sometimes there’s no one right answer! If you’re working with a publisher, your editor should be happy to help with any queries that you have. Thank you so much Mrs. Luke. It helped. Though the school in which I studied is considered one of the best in northern India, but they didn’t teach us much grammar. I’m working on a novel and I don’t want any grammatical mistakes to crop in. Do you think it is necessary for aspiring writers to read a standard grammar text book? Or one should absorb the grammar rules by reading prose (novels, newspapers, magazines etc.) and by watching English movies? If a book is necessary, then which one will you suggest? Your grammar is great, Farhan; I think reading plenty of prose is an excellent way to develop a good working knowledge of English. If you do feel you need more help, though, the site http://www.dailywritingtips.com has lots of great advice on grammar and other topics. #3 was very helpful. I don’t know how much time I’ve spent writing where I pause to think of a dialougue tag. This just puts into my head what I always wanted to be true anyway, I was just taught the opposite. Keep up the good work… out of all the blogs I follow for writing tips yours always seems to be the most helpful week after week. Thanks Bridges, glad this helped! I don’t know why so many of us have been taught the opposite (you and I aren’t the only ones … I had an email from one of my readers who’s in her teens, who says schools are STILL teaching people to use synonyms for “said”). I might have to start a one-woman campaign..! I’d help with that campaign once I get oout of the military and move back to the states I’m planning on going to school to become an English teacher. I enjoy doing dialogue but there are always things to learn. Good advice. I also have enjoyed reading your other blogs. Lots of very good and easy to understand advice. Your blog is a very helpful resource. Thank you very much! My question is how to handle explicit dialogue. My novel has an urban setting and a lot of expletives. How much is too much? I want it to sound real, and much of it is humorous, but I don’t want it to overpower and offend. Any advice would be helpful. Thank you! Great question … and one I struggle with myself in my novel! What I’ve found is that even when a certain amount of swearing is realistic, it’s easy to have it sound over-done (a bit like any aspect of dialogue really). So I try to keep the expletives for situations that really demand them. You could also think about using speech patterns, slang/idioms, and so on to help make things seem realistic. Or how about non-verbal communication (e.g. sticking up a middle finger …) if you feel the dialogue is getting a bit expletive-heavy? Those were some very good tips. They are simple but should be very useful if used properly. Thanks Tim, glad you found them useful. I spent several years very shy and introverted which meant I spent a lot of time thinking about how I would actually start a conversation. Turns out that helps later down the line when you’re trying to write a dialogue which sounds plausible and flowing. I am a person that finds it very difficult to get good grades in my english courses. This is a very good explanation of dialog and some really good tips that I know will help me when I write my dialog from now on. Thanks for sharing this informative piece of article. great information provided, it’s help a lot! Thanks so much! Um, those are adverbs, not adjectives, and the period goes inside the quotation mark in your writing, too. Your posts are always engaging and very helpful, but the numerous grammar and mechanical errors can be a bit distracting. It’s so important to model both effective (as you do) and correct usage, so your readers don’t pick up bad habits while they are learning valuable crafting lessons. Joy, thanks for the adverbs/adjectives spot. I meant to reference both there! I write British English (I’m in the UK) and we can place punctuation outside quotation marks when the punctuation isn’t part of what’s being quoted, as in that example. I just finished a work where written slang was extensively used. I used the contracted slang word “gunna” not “gonna”. The two words, (more precisely the two vowels contained in the first syllable of each word) have distinctly different sounds. If the objective is to have characters sound realistic, then the word “gunna” is appropriate. People in daily speech don’t say “I’m (gone ah). They do say “I’m “gunna” and say it often. They certainly don’t very often use the correct grammar of saying “going to”. I agree that such usage should be sparing, but stilted unrealistic language in a characters dialogue unconvincing. I want my readers to “hear” the dialogue as well as read it. What is your opinion Ali? Excuse the slow reply, Michael! I’ve been away visiting family. I personally use “gonna” as a contraction of “going to” (it works for me!) and, like you, I’d do so sparingly. I would pronounce it as you pronounce “gunna”. It’s very tricky to find the right balance between authenticity and readability, and I’m sure genre and reader expectations will have an impact here too. Ultimately, if it works for your audience, go for it! Perhaps it’s worth running the manuscript past a few beta readers to see if they feel it’s working (i.e. the use of “gunna” isn’t distracting or obtrustive)? Best of luck with it! I’ve heard that “I’m leaving,” John said, is preferable to “I’m leaving,” said John. Do you have an opinion? Thanks for ideas. For whatever reason, “I’m leaving,” said John doesn’t have that archaic ring to it, but I suspect it’s slowly going that way. If you prefer the sound of “said John” rather than “John said” in a sentence, then I don’t see a problem with it — but all things being equal, I’d go with “John said”. I have a TON of trouble in figuring out how to integrate interruptions and asides into my writing and dialogue. I also find myself having trouble with writing dialogue between three or more people; I have trouble squeezing in lines of dialogue with each person. Also, is it required for each character present to speak? With three or more characters, it is tricky, and I find that I often have to fine-tune the dialogue and the patterns of who’s speaking at a later stage, when I revise my first draft. You don’t necessarily have to have everyone speak (though if one character is silent throughout, readers may wonder why; they may also forget that the character is present, if they’re never mentioned). If you have a conversation where only two people need to talk, could the third leave the room, or be occupied elsewhere?